So About that Nintendo E3 strategy. Before E3, Nintendo made known it would only bring the new Zelda game to the E3 show floor. And while this left room for Nintendo to discuss and reveal other games (which they did), it was clear that the focus for this year’s E3 would be its shiny new Zelda game. Also, instead of using this Zelda as a way to introduce us to its new NX, it would be nothing but the Wii U version. Now today, the internet is flooded with raving reviews and uber-hype for this new Zelda meets Skyrim meets awesomeness game, and I’m firmly on the hype train. I figured I’d like to chime in here on TAY about how much I love what I’ve seen, but another thought quickly rose that I’d love to share and discuss with as many of you as I can. Because the fact that Nintendo basically made E3 the grand Zelda display is a very interesting move. An open-world Zelda hints at a new Nintendo unconstrained by the boundaries of its past. 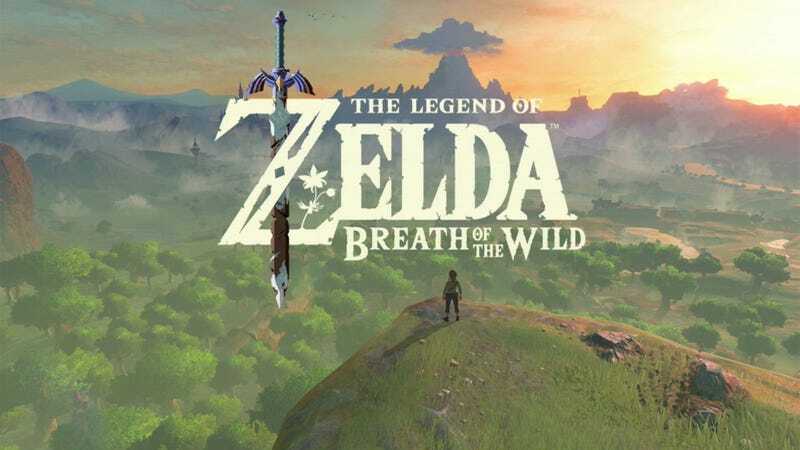 To paraphrase and make a long story short, Breath of the Wild was created with an all new Zelda team consisting of developers with interest and knowledge on contemporary games. (I read that as people who love Skyrim and The Witcher, but also others like COD or GTA). Meaning Mr. Aonuma let other games influence this game much more than he has done with games in the past. So there you kind of already have my point, Nintendo has taken a vastly different approach to creating this Zelda than it has done with all of its previous releases. And this is E3 has been used as a giant testing ground for fan reaction. They’ve basically shown the entire basis of the game sans the story. But there is more that makes me think this. Strap yourself in, because this will take some paragraphs. Nintendo needing an entire E3 to sample the reaction of their new game design philosophy insinuates that they needed to change their current philosophy, and there is much reason to believe so. To put this in perspective, let’s quickly go through Nintendo’s home console efforts up until this point. So Nintendo started in the 70’s with plug and play devices, and later single game devices with their color-tv series, and their game and watch devices. But they had an international breakthrough with their Famicom/NES system which conquered the world and basically set the tone for the game market as it is today. Their SNES enjoyed great success following its launch in 1990, but it has to be noted that it’s less succesfull than its fore-bearer. While many of us look fondly back at the days of 16 bit greatness and the grand console wars with Sega. The SNES did not maintain the NES momentum and even lost a great deal of ground to SEGA. The N64’s mission must have been to reclaim the lost ground. The history of the N64 is a bit of wild one though, it contains classics that are held as absolute masterpieces like Mario 64 and Ocarina of Time, yet it has the smallest library of games and it lost major grounds to the new Sony PlayStation. In fact during the N64 years Nintendo lost its status as the definitive house of games. The Gamecube was even worse off. It contains games that are held dearly by its fans but aside from maybe Smash Bros. Melee, the Gamecube library doesn’t contain any games on the level of Ocarina of Time when it comes to a social and market impact. Yet by analyzing the types of games the Gamecube has, it’s clear Nintendo was way ahead of what many of us thought would be necessary. The Gamecube didn’t launch with a Mario title like its ancestors did, instead it launched with Luigi’s Mansion, a quirky “horror” game starring Luigi, who for some reason has become a scaredy cat. The actual Mario game was based on a single game mechanic with Mario’s water spray FLUDD. Zelda dropped both its “realism” and its land based gameplay with The Wind Waker, and Pokemon had full fledged adventures with a defining twist of “stealing” Pokemon. Donkey Kong was played with Bongos. And Star Fox was now a Zelda clone. Couple that with games like Chibi Robo, Pikmin and Doshin The Giant, and you can see Nintendo was being highly experimental with the Gamecube. And it’s easy to see why, their efforts through their consoles had diminishing results. Something had to change. And while it’s all speculation on my part, I think that Nintendo having had the strongest specs among their contemporaries and maybe even the best way to deal with piracy (proprietary disc format), was thinking halfway through the Gamecube years that changing the essence of your games wasn’t the way to go. Even if just churning out new games wasn’t helping them either. The NES to N64 was a declining journey, and these systems just upgraded the games as they were. The Gamecube was also a losing battle, even though the games were all refreshing and new. The problem Nintendo was facing was a decline in sales and interest. Its problem definition: a declining interest in the games Nintendo make. Part of the problem, changing the games is not the answer. So Instead of changing the games, why not change the way we interact with games. And here was the Wii, a massive success catapulting Nintendo’s war chest back to NES levels and even beyond. And while Nintendo fans were raving, and non-gamers were raving too, the internet quickly gave rise to those who felt otherwise. Nintendo was now a casual company, no longer catering to those truly in love with video games. And while Nintendo resumed its business they must’ve known that losing the core gamer meant losing their future as a games company. After all the “casuals” would move to the new trend when it would arise (and so they have with IOS and android) and they’d be stuck with nothing. Yet just making their next console on par with the PS4 and XB1 would just put them back in the position they were in during the GameCube years, but this time with a lot less favour among fans. The answer with the Wii-U was to maintain their renewing of the game interface, while trying to win back the lost gamer crowd. I distinctly remember the messaging of the Wii U on launch: this would bring in third party publishers. The greatest games would sit alongside Nintendo’s finest on the Wii U and both the new interface and the new games would help Nintendo get back on track. But early on in the Wii-U’s life the writing was on the wall. Third party publishers were nowhere to be found. So we are getting to the NX, and I think that anyone by now can see that the interface doesn’t really matter (as long as it makes sense). It’s about the games themselves. And while Nintendo has great games, its third party support drops them out of the market. The Wii-U didn’t save it (the third party plan failed), and it’s arguable that Third party publishers will not invest in Nintendo if they don’t prove their next system immediately. Nintendo needs to sell its next system with its own new games. So Nintendo must change their game design. Their games need to be beyond great to appeal, they have be renewing, and surprising. And I think Nintendo started this train of thought in the first year of the Wii-U. As an experiment I believe they set up a team of young developers who would be unrestrained in their developing. And they set out to create a new type of game. This game would turn out to be Splatoon, and its massive success (given the Wii-U install base) gave Nintendo the clue for its new approach. It’s time to refresh, out with the old and in with the new. The Splatoon experiment worked. It’s time to bring it to a big series. Breath of the Wild must have started development in 2011 after Skyward Sword, but I guess that Splatoon’s launch and success altered it’s course to become what we see today. So there you have it. I believe Nintendo just used E3 to test the waters of a new design philosophy. Granted, my theory is full of assumptions and conclusions that are in no way based on actual sources. But I still believe thinking about this together may help in understanding Nintendo, and in a way, understanding future announcements.